A unique survivor of the network of open-air swimming pools that once existed across Wales. Lido Ponty merges arts and crafts and art deco architecture; the pool retains the original outdoor changing boxes and turnstiles, dating to 1927, as well as the art-deco features of a 1934-35 extension and refurbishment of the original building. The most striking feature is the roof, which comprises terracotta tiles evocative of the Mediterranean rather than the more typical blue-grey slate used elsewhere in the town. 25m pool, activity pool and a shallow splash pool with umbrella water fountain. The activity pool hosts inflatable obstacle courses, zorbing wheels and paddle boats. All the pools are heated to 28 degrees. 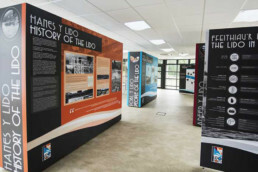 There are indoor and outdoor changing rooms and showers, sunbathing areas, Waterside Cafe and a Heritage centre that tells the story of Lido Ponty’s history and restoration. The surrounding park is the town’s permanent war memorial and was opened by Viscount Allenby on August Bank Holiday 1923. 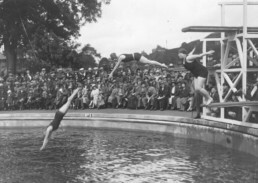 The pool was constructed a few years later thanks to financial support from the Miners’ Welfare Fund. It was the largest open-air swimming pool built in the South Wales Valleys and was originally filled with water from the river which runs through the park. 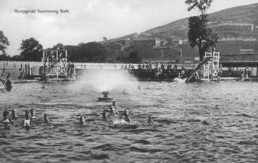 The National Lido of Wales, Lido Ponty, is currently fully operational and maintained by the local authority as a leading aquatic attraction in South Wales. 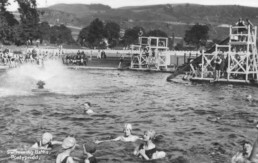 Rejuvenated and reopened in 2015 following the award of £6.3m of funding from the European Regional Development Fund, the Heritage Lottery Fund, Rhondda Cynon Taf County Borough Council, and Cadw, the Lido attracts upwards of 70,000 visitors a year and is regarded as one of the great revivals of twentieth-century sporting heritage. Future plans include the development of a training centre to ensure long-term sustainability of staff and to enable future generations to gain vital skills necessary for careers in the leisure industry – a modern twist on the original educational remit of Ponty Baths.